Today is the day! 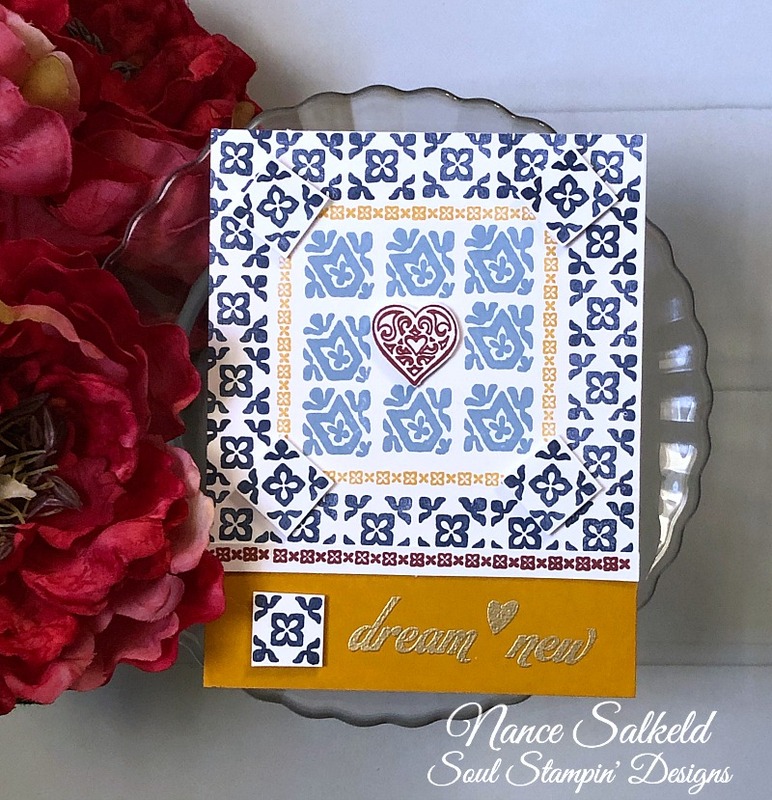 The new Stamp of Approval Collection, Adoring You is ready for purchase in the Catherine Pooler Designs Shop later today. 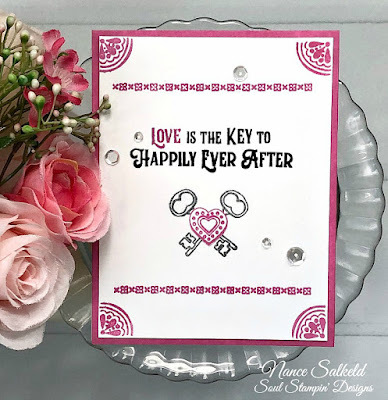 If you aren't familiar with Stamp of Approval, it's a quarterly collection of themed stamps, dies, sometimes other goodies coordinated to go together and to help create beautiful cards or projects. Each collection is exclusive and there is a limited number for sale. Once it's sold out the products aren't available again until maybe months later. But, if you're a Stamp Nation member, then you get to order early, a perk of being a Stamp Nation member. It is very easy to become a member by signing up at Catherine's site. Lots of perks and benefits of joining this online community. My first card is pretty clean and simple. I used Be Mine and Midnight CP ink for it and bits and pieces from The Key and Congratulations stamp sets. I love that little corner arc stamp. I have a couple more ideas for that little baby, just ran out of time to do it. The next card I got a little "artsy". I was inspired by the cover of a coloring book I have, Vive Le Color Japan that has cherry blossom branches on it. Again I stayed with a monochrome color palette, using Polished and Twilight. I used a fan brush and brushed streaks of Polished onto slightly wet watercolor paper. Then I stamped the layered flowers, embossing the top layer in white embossing powder. Next I set the panel in my Misti and lined up the tree branch with the flowers, starting at the top. I inked it with Twilight, stamped it off on scrap paper (or rather pressed the scrap paper on it since it was in the Misti. Then I gently closed the lid almost all way to see where to wipe off ink near the flowers. I guess you'd call this a primitive kind of masking. lol Once that was all done around all of the flowers, I stamped my sentiment with Versamark and embossed in silver. 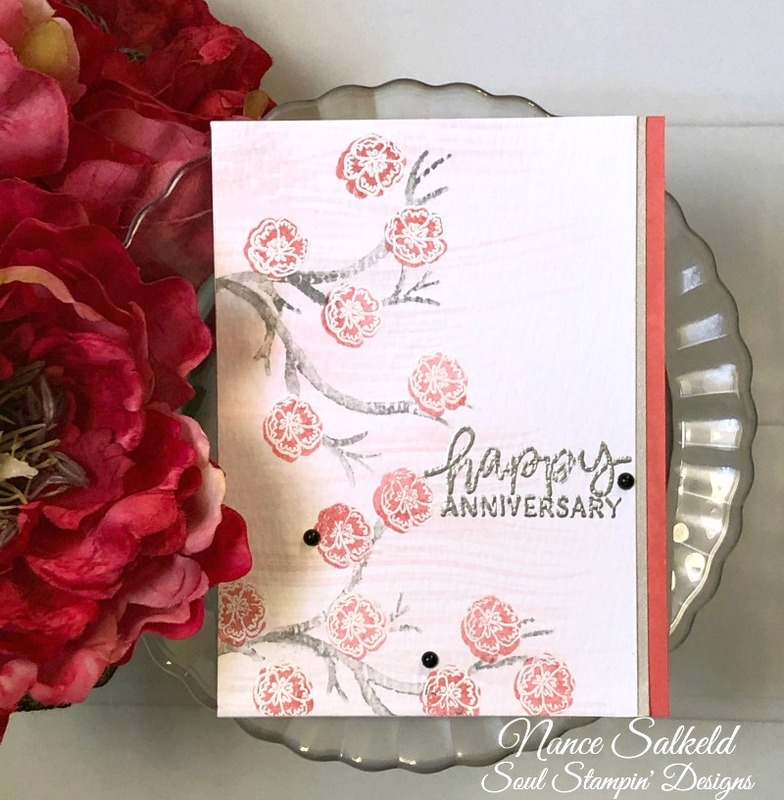 I trimmed the panel down, added a strip of silver cardstock for a little more sparkle and laid that whole thing on a cardbase inked on one side with the Polished CP ink to match my flowers. For a little contrast, I added three black enamel dots. My final card, I pushed myself out of my comfort zone a bit. In the Congratulations stamp set are two little square geometric stamps. I had this image in my head of tile squares, like Moroccan or Greek tiles. So, yes, I stamped all those little squares all around, along with that cute little border stamp. I chose colors from the Spa Collection as I wanted a little more muted tones. I used Juniper Mist, Stone Blue, Sauna and Peppermint Scrub. 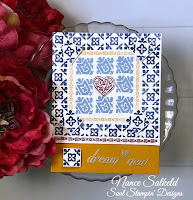 After all the stamping, a little cutting and popping up some of the squares, I stamped and embossed the sentiment in gold to give the card more of a Moroccan feel. 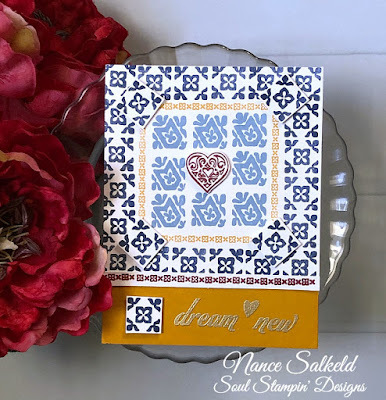 So just as a reminder again, today is the actual Release of this Stamp of Approval Collection, Adoring You, so if you're interested head over to the Catherine Pooler Designs Shop and shop away. I want to thank Catherine Pooler again for inviting me to be one of the Guest Designers for this SOA Collection Release. I had so much fun getting to play with some of these stamps early! It's a beautiful and fun set! 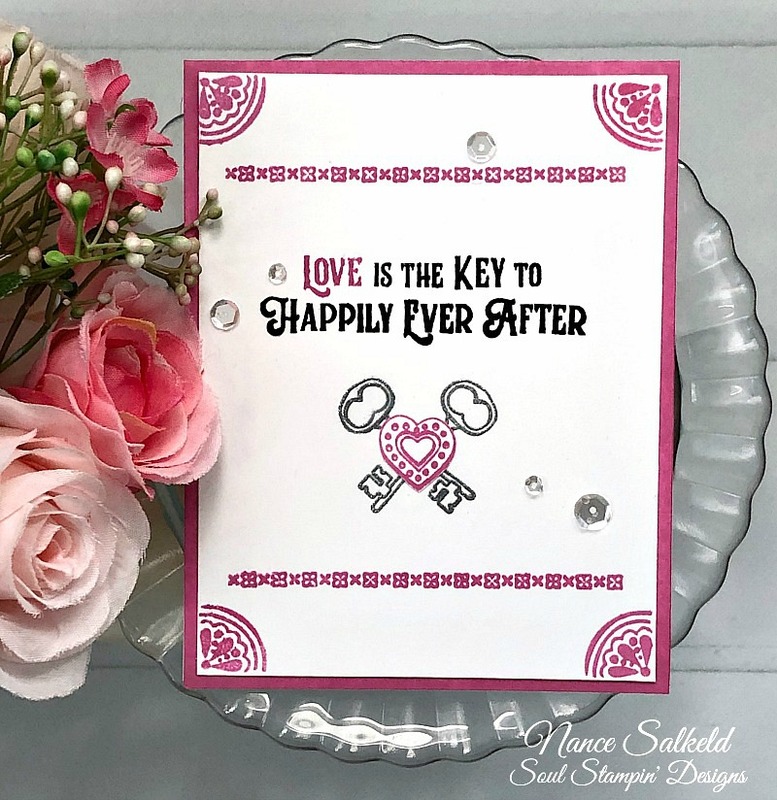 I love the heart with keys in the center with the little borders and corner stamping! And I think that was a clever way of masking those flowers! Cutting masks would have been tedious! Your tiles are amazing! I can't imaging getting them all stamped so crisp and perfectly lined up! Great job, my friend!